Shopping is one of my favorite pastimes. Since moving here, I've come to appreciate it even more, because I don't get to do it as much as I used to. It took me awhile to find some good stores that were fun to browse through and had what I was looking for. Now, my best friend + I will arrange a girls' day out, and drive to Santiago to make the rounds of our favorite places. We stock up for a month or two on the things we can't find closer to home. Price Smart is much like Costco. I was so happy when we discovered this store in Santiago. If I'm ever feeling homesick, being in that store, feels almost like home. 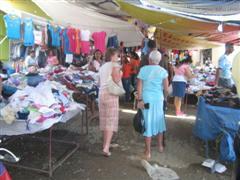 Tuesdays + Wednesdays, La Pulga (flea market) in Puerto Plata is open. We can spend hours there, looking for those illusive "must-haves". It's like a treasure hunt, digging through the tables piled high with clothes, shoes + handbags. They have everything from cast offs, to knock offs. to name brand items from the free zones. Closer to home, our favorite grocery store, Janet's, is only 1 km west of us. Very handy + good prices, so we buy most of our groceries there. Whenever I'm feeling a bit down, and looking for a wee pick-me-up, going for a shopping day with my best friend, is sure to do it!